A while ago I was looking for a wheel for my eldest daughter’s 21st birthday. She actually asked for a wheel for her birthday, I kid you not. So, I put out word amongst the guild members and even put an ad in our newsletter about wanting a second hand wheel. Several offers came in: one was perfect — an Ashford Traditional in great shape, with bobbins, a lazy kate and a set of wool carders — at a good price. That’s the one I purchased for her birthday. There were other offers at either end of the spectrum – junk or way out of my price range. One gal had an interesting box of wooden pieces that contained an entire wheel that she was willing to give away. A neighbour of hers, knowing she was in the guild, asked her to find a home for the sad thing. I traded her a pound and a half of handspun for the box of bits. I brought it home — assembled it to the best of my knowledge and lo and behold, it was a lovely little wheel, a castle style wheel. Some internet research revealed that it was made in New Zealand, called the Thumbelina. Thumbelinas were made by Baillie and Watts under the name Sleeping Beauty, probably in the 1970s. I love the size and shape of it. After a bit of tinkering I got it to work and spun on it for a while. Right before a spinning demonstration the leather piece attaching the wheel to the treadle broke. As I was trying to fix it, the flyer broke. This seemed like a bad omen. The leather thingy I could fix, but the broken flyer, I was stuck. It has sadly sat in the corner of the landing for the last two years. Then, inspired by the other wheels I have brought into the house, I tried fixing this up. Did the leather thing no problem. Then tackled the broken flyer. I drilled a hole in either side of the break, inserted a dowl into it, glued it like crazy, then clamped it for the week. I took off the clamp, sanded it and to my amazement, it worked. You can still the place where it broke, but that’s like a scar. A sign of being well worn, and loved enough to be repaired. And here she is, nicely sanded up with a first coat of natural MinWax on her. I can’t believe what that stuff does to wood. I brings it back to life in the most amazing way. I am going to spin on her this afternoon. Will let you know how things progress. This entry was posted in Uncategorized on February 13, 2011 by DianaTwiss. You can only comb so much fleece in a day. 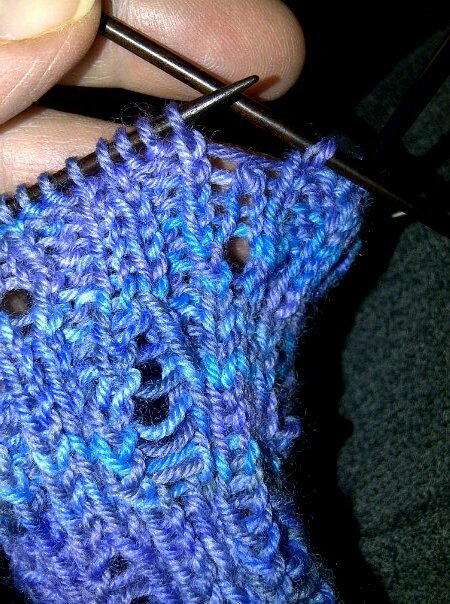 After a while your arm gets tired, and the pile of fleece isn’t diminishing as quickly as you’d like it too. 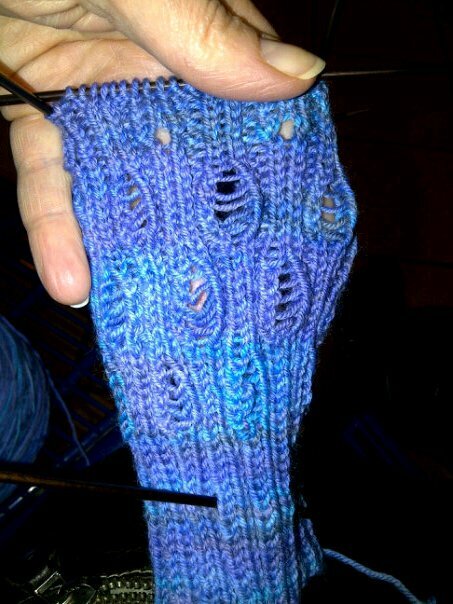 So to keep myself inspired, I started a pair of socks. I bought the yarn at my LYS a while ago, can’t find the label right now, but it was a varigated yarn by Cascade. 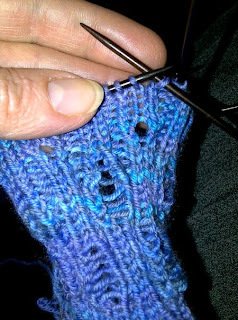 Then I searched for the right pattern — and found it on Ravelry. It’s called Somewhere Down the Lazy River, by Lorraine Umbers. Perfect companion to the blues, greys and purples in my yarn. The pattern uses carefully (yet easily) constructed drop stitches. 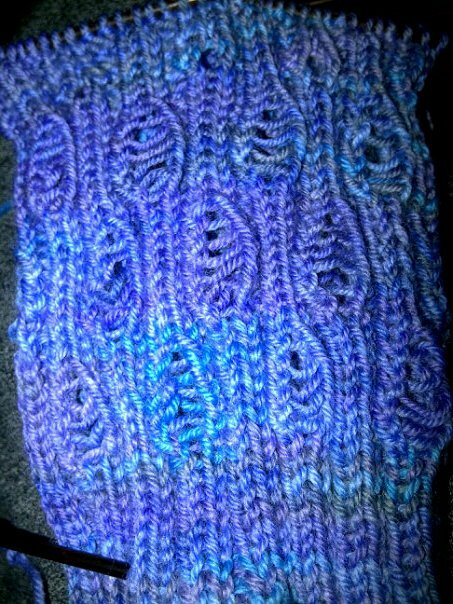 The piece is a 2 X 2 rib stitch. On alternating knit stitches, you set up the drop stitch by doing a yarn over. This creates a third stitch in the rib pattern. On the 7th round, you drop that stitch and it ladders down, created a widening, that I think looks the like waves and currents on a lazy river. Here’s the photo essay. These are the channels of dropped stitches. 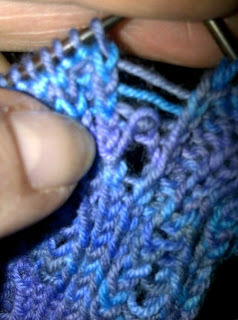 This middle stitch is the one that is going to be dropped. The only time you love to watch a dropped stitch travel down the ladders. On the next round you close it up by continuing in the 2 X 2 rib. This entry was posted in Uncategorized on February 7, 2011 by DianaTwiss. So you may have been wondering in the past while, what ever happened to the idea of 100-mile wear. Well, I haven’t abandonded the idea at all. I was seduced by all the wonderful yarns and patterns out there and my own desire to make things FAST. This fibre is amazing: it is extremly soft – no surprise since the breed is 3/4 Merino, yet the staples are long — 4 inches, (10 cm) thanks to the 1/4 addition of the longwool ﻿from the Lincoln. There is a good crimp on this wool — crimp being the waves you see in the wool. Crimp allows the yarn, once spun and washed, to have some elasticity, a desireable effect. 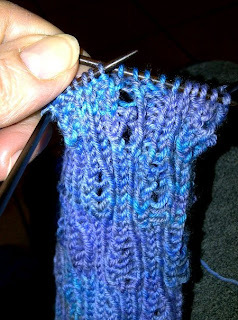 You want your sweaters to stretch with you when you bend your arm or reach for someting, and then move back into shape. The staple on the left, when stretched out is 4 inches, the one on the right, when stretched out is nearly 5. For those of you out there who spin, this makes for dreamy spinning, especially if the fibre has been prepared using wool combs. My plan today is to comb up a bunch of nests — maybe even as much as a 1/4 of a pound, and spin it up on my wheel. This kind of fibre wants to be spun fine, so I’ll do it. And then, the skeins will hit the dye pot — I’m thinking some varigated yarn with analagous colours. This entry was posted in Uncategorized on February 6, 2011 by DianaTwiss.